In December 2015 the antennas needed some significant maintenance. 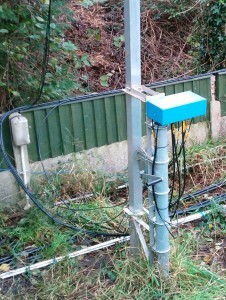 The Inverted-L had snapped in wind and due to the work on the garage the SixPak remote switching had not been wired in. Over a couple of relatively dry days the remedial work was carried out. Modifications to the G3TPW Cobwebb were made to add extra feeds. 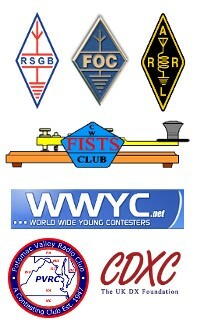 Now 20m, 17/15m and 12/10m are presented on three separate cables. The 40m/30m parallel dipole is still in use. A new, higher power, remote antenna coupler was installed on the Inverted-L, along with new wire and also side guys for the fibreglass pole. This covers 160m, 80m and 60m. The SixPak was fitted and wired up with new screened control cable and new coax cable to the shack and the antennas. Remote SixPak antenna switch at base of mast. 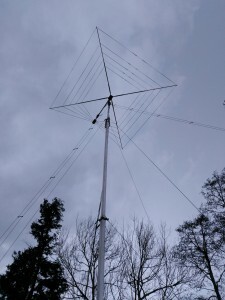 For VHF there is currently an EAntenna 6/4m Dual-band Moxon Rectangle on a small rotator on the back of the house.